Im looking to buy a darth nihilus lightsaber. I have a place to get the saber from, and i can find a case. The saber is not a master replica, but it would be nice to get a plaque that looks like one. Also there is someone who is selling a saber that doesnt look like nihilus saber, but he still has a plaque that looks like a MR plaque. 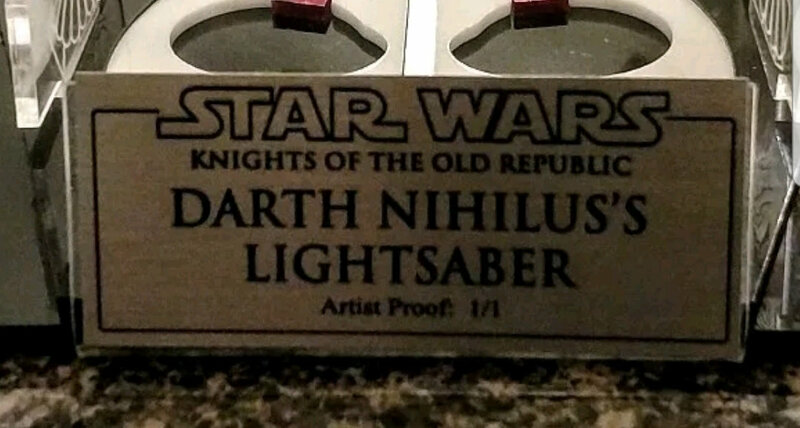 He isnt willing to sell just the plaque as far as i know, and the saber doesnt exactly look like nihilus. I asked where he got the plaque done, but he said it was a while ago and he forgot. I attached the picture of his plaque (the guy who is selling the plaque), and that is pretty much EXACTLY like i would like mine to look like (except without "artist proof: 1/1"). So does anyone here know where i can get a custom done plaque exactly like that? Depends where you are based. Over here trophy shops (for sports teams etc) sell and engrave plaques identical to that. So can you tell me where i can get one? No. Because I don't know where you are and wouldn't encourage the sharing of personal details like that. Google "trophy store near me". Got it man. Thank you so much! You run a CNC mill? It wouldn't be that hard to design in a cad program and chase the lines with a small endmill.